We have family, double and twin bedrooms, all ensuite. Depending on the time of year and the type of room we charge between € 25.00 to € 35.00 per person sharing. 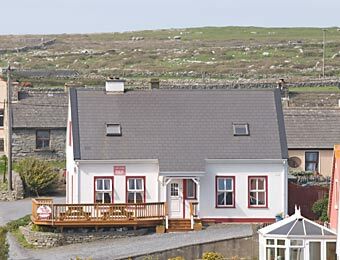 Lane Lodge Bed & Breakfast Accommodation is situated in the heart of Doolin village near the shores of the Atlantic Ocean and is only 2 minutes walk from Gus O'Connor's Pub, famous for its Traditional Irish Music sessions. Our restaurants offer fine foods with local seafood a speciality. Doolin's world-famous pubs feature traditional music sessions nightly throughout the season. Shops offer locally made crafts and music shops have a range of items to suit all tastes. If you are exploring the area on foot, bicycle or by car, you will find our home is ideally located to discover North Clare. View the spectacular Cliffs of Moher, explore the ruggedness of the Burren landscape or take the ferry to the Aran Islands. Other local aminities include golf at Lahinch championship golf course, swimming, horseriding, fishing, pitch and putt and for the more adventurous caving, rockclimbing and orenteering. We will do our best to make your stay in Doolin a happy and memorable one.